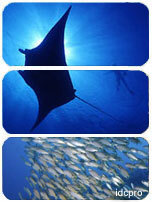 Scuba Diving in Malaysia - GO PRO become a PADI Divemaster! Open doors you have only imagine...whether you work in a local dive center, at a resort, or on a live aboard dive boat, the adventure of a lifetime is yours for the taking. Imagine a job where you actually look forward to heading off to work in the morning. Lead a life others fantasize about. Sailing into incredible sunsets could be the rule, not the exception, especially if you work in a tropical dive destination. The commute to work could be as easy as a ten-minute boat ride. Work now becomes an adventure in itself. While experiencing new cultures and lifestyles, you'll be surrounded by people who are always happy. When you take people diving all day - everyone's happy. It's not all fun and games in paradise, but the rewards are well worth the effort. If you set your sights close to home and aspire to work at a local dive center, you teach people how to dive and guide trips to exotic dive destinations. There's a sense of pride sharing something you are passionate about. You help others enrich their own lives by experiencing the adventure of diving. For a lot of people SCUBA Diving is a dream job, and the opportunities are endless. Be the best you can be...be a PADI divemaster! Your professional dive training leads you through a series of teaching and learning experience programs. It's a challenging road, but the rewards are innumerable. After completion, you will be ready to work as a PADI professional, go on to become a PADI instructor, or simply enjoy your newly acquired training and extensive dive knowledge. Less than one diver in a hundred becomes a PADI divemaster, one of the most respected ratings in the diving community. Do you think you could be the one? Take the plunge now! As you may know, many PADI Divemasters go on to become PADI instructors. So, the training and experience you gain through the PADI Divemaster program helps shape your abilities and attitude toward becoming a professional level diving educator. Our DM course involves developing your knowledge of dive theory, assisting on a dive courses, to develop control and problem-solving of diving activities; guiding tours and working on customer relations. As an optional extra, the divemaster candidate, once certified, is eligible to enroll in the EFRI Course and be certified to teach EFR courses. The Insured divemaster may also teach and certify PADI skin divers and conduct the PADI discover snorkeling program, as well as conduct the scuba review program for certified divers. Once certified, take a look at your next step Assistant instructor, Emergency first response instructor or you can move on directly to Instructor development course idc.